This unusual clock has a transverse movement and stands dramatically as an unsupported sphere on any flat surface. Touch it, and it wobbles gently to and fro, gradually coming to rest in the same upright position. 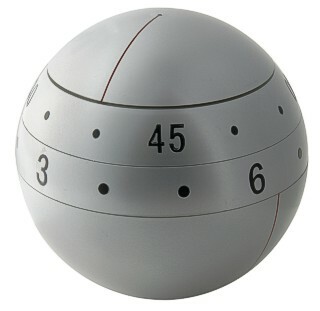 The spherical cap is the second hand and the two segments show minutes and hours in numerical format. This contemporary clock is battery operated and is an impressive 15cm in diameter (6 inches).